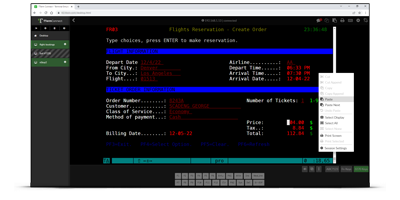 Centrally managed, browser based HTML5 terminal emulator. Any host, any device. TTerm Connect offers its own client front end, a web based replacement for a desktop terminal emulator, or if you want to go your own way, TTerm Connect will integrate into your existing website or page. Your users can seamlessly transition from one device to another, transferring a session from a tablet or mobile device to another desktop or device and pickup up from exactly where you left off. Not only is this convenient, but in challenging environments such as warehouse facilities or factory floors where WIFI dropouts may be an issue, TTerm Connect maintains the host connection so that your users can jump back in. Built in management tools enable real time user and session monitoring and smart features such as 'shadowing' let help desk staff step in and assist end users or gracefully disconnect a host session. The server component is available for both Windows and Linux based servers, specifically Centos 7 and Redhat 7. Exact hardware requirements will depend largely on the number of concurrent host sessions you anticipate running. The specifications below assume a site serving up to 200 concurrent host sessions. For larger site requirements please Contact Turbosoft. Support for Apache and IIS. The table below illustrates the range of terminals emulated by TTerm Connect. Interested in a live demo or a trial installation at your site? Register your interest here. 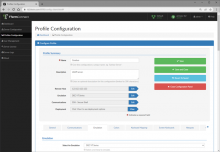 Manage, monitor and configure terminal emulation sesssions. 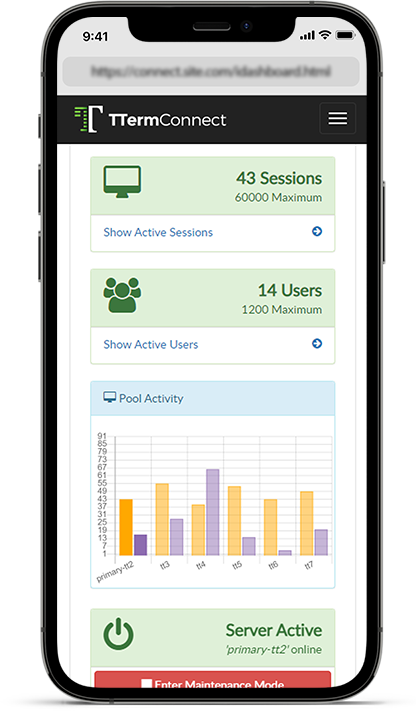 The administration dashboard on a mobile device. Note, actual screenshot, rendered outer device. The desktop client showing a number of available sessions. 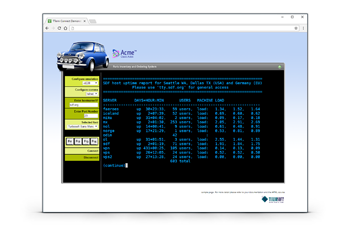 Terminal emulation embedded in an existing webpage. 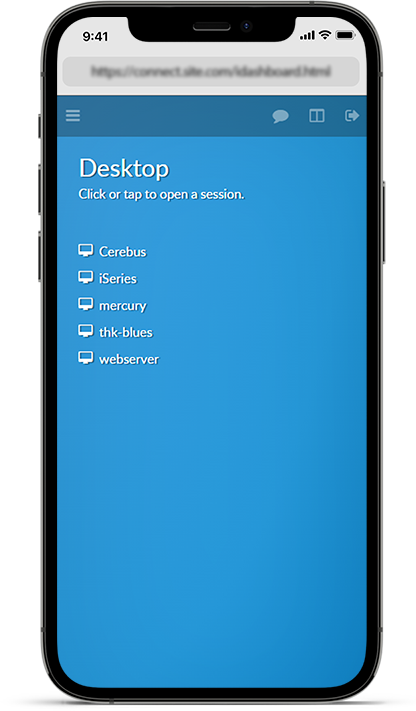 The desktop client showing a number of available sessions on a mobile device. Note, actual screenshot, rendered outer device. ...or embed in your own webpage. 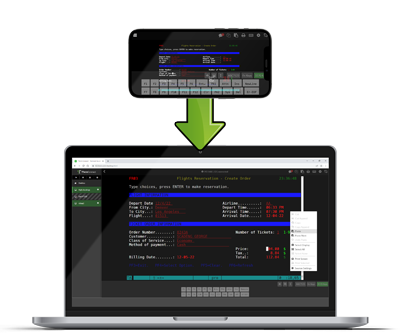 TTerm Connect is a fully featured product and a worthy replacement for traditional desktop terminal emulation software. It offers supports for over 80 terminals including DEC VT, IBM3270 and 5250, Wyse, ANSI, Televideo 955 and many more. TTerm Connect supports multiple communications protocols as well as advanced functionality like macros, full keyboard remapping, Hotspots for mouse or touch interaction, DBCS support, pass through printing and much, much more. When working in challenging environments like warehouse or factory floors WIFI dropouts can be detrimental to reliable host connectivity. 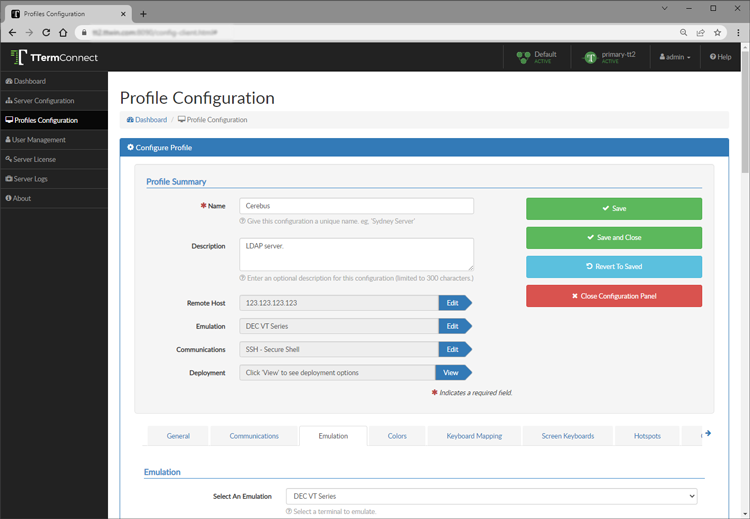 TTerm Connect maintains your end user host connection at the server level and allows clients to seamlessly reconnect and continue working. 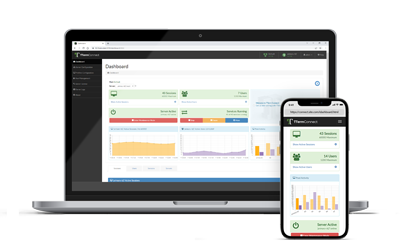 Centralized web based management allows user and group level access control and gives administrators the power to configure, manage and monitor user activity in real time. Support for Microsoft Active Directory and LDAP integration. Administrators can 'shadow' a user session to observe live client activity. Provide technical support and assistance or temporarily assume control of a user session and interact directly with the host system. Take your sessions with you - transfer between devices. Moving from a laptop to a desktop, from a phone to a tablet? No problem - TTerm Connect lets you securely and seamlessly transition from one device to another, maintaining your host connections and allowing you to continue working from where you left off. TTerm Connect is licensed based on the number of concurrent users. Discounts are available to non-profit organisations and recognized educational institutions. TTerm Connect maintains server side performance by automatically distributing session processes to maximize performance. No more dropouts, no orphaned sessions due to battery issues, devices reboots or patchy WIFI.